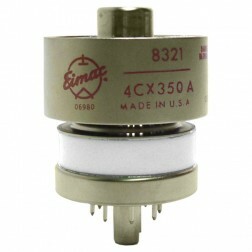 4CX350 Series - Tubes - Transmitting, Audio, Misc. The 4CX350A/8321 has a maximum plate dissipation of 350 watts and is intended for Class AB audio or RF amplifier service. The tube is externally identical to the 4CX250B but contains rugged internal construction features. Amplification factor and cathode area have been increased over the basic 4CX250B to give higher transconductance and figure of merit. 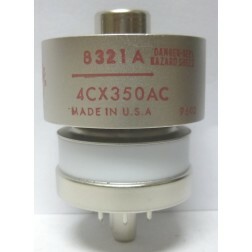 The 4CX350AC/8321A is a compact air cooled tetrode. This product is intended for use in equipment which normally uses the 4CX350A, and where extended tube life is a concern. Externally, the 4CX350AC/8321A is identical to the 4CX350A. Electrical characteristics are the same in both tube types with the exception that the heater warmup time is increased to 40 seconds in the 4CX350AC/8321A. The 4CX350F/8322 has a maximum plate dissipation of 350 watts and is intended for Class AB audio or RF amplifier service. 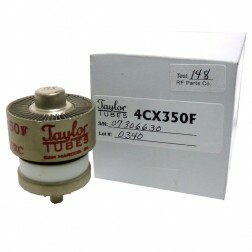 The tube is externally identical to the 4CX250B but contains rugged internal construction features. Amplification factor and cathode area have been increased over the basic 4CX250B to give higher transconductance and figure of merit. The 4CX350FJ/8904 is intended for Class AB linear RF amplifier service. The tube has rugged internal construction features. The 4CX350FJ/8904 may be used as an exact replacement for the 4CX350F/8322 in most linear applications, requiring only minor circuit adjustment and retuning. The tube has improved intermodulation distortion characteristics. It contains a 26.5 volt heater, and is recommended for new equipment designs. RF PARTS COMPANY provides full testing and matching services to our customers in order to assure they will receive full value in their investment. NEW TUBES TESTING AND MATCHING. All new tubes we buy to sell under our Name, will receive our Standard Factory Testing at the RF PARTS facility before acceptance from the manufacturer. Tubes are tested for Transconductance, Filament Condition, Shorts, and Gas. After full testing, the tubes may be marked with either the RF PARTS or TAYLOR labeling. The next step is to make electrically matched sets for the customer. Any that fail our tests will be returned to the factory. Each tube carries a Limited Transmitter Tube warranty. Warranty period varies by tube number. 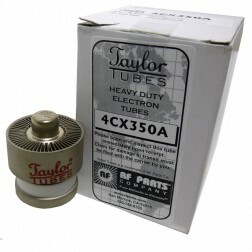 RF PARTS has a limited number of like new tubes with older date codes. All tubes receive the Standard Factory Test for each tube type. 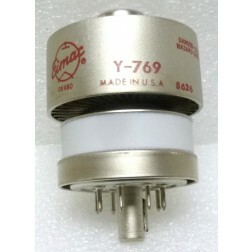 We still have U.S. made EIMAC and AMPEREX tubes available in limited quantities. NOS: A like new tube which tests at 100%. Silver plated tubes may exhibit some silver tarnish (which does not detract from performance). Some tubes may show faint marks from the socket in our testing equipment. All NOS tubes carry the RF PARTS Standard Limited Warranty covering workmanship and materials for 90 days. NOS-1: A like new tube, testing at 95-100%. Tube may have some cosmetic blemishes, scratches, light tarnish, etc. 90 Day Limited Warranty. NOS-2: Full testing as we do for our NOS & NOS-1 Tubes (95%-100%), but having more surface tarnish, scratches, etc. Still a perfectly good tube electrically. 90 Day Limited Warranty. P: This is a “Good Used Tube” or “Pull”. Some are removed from New or Reconditioned Military or Commercial Equipment. This tube receives the Full RF PARTS Testing, and is electrically similar to our NOS-1 tube at 95%-100%. There may be some scratches or discoloration indicating that the tube had been in a socket, etc. 90 Day Limited Warranty. P-1: Similar to our –P selection, but may have more cosmetic or older date codes. Full RF PARTS Testing, and is electrically similar as our NOS-1 tube at 95%-100%. 90 Day Limited Warranty. P-2: Similar to the –P tube, but more obviously used due to cosmetic issues. Tests in the 90%-100% range. Plenty of life left. 90 Days limited Warranty.